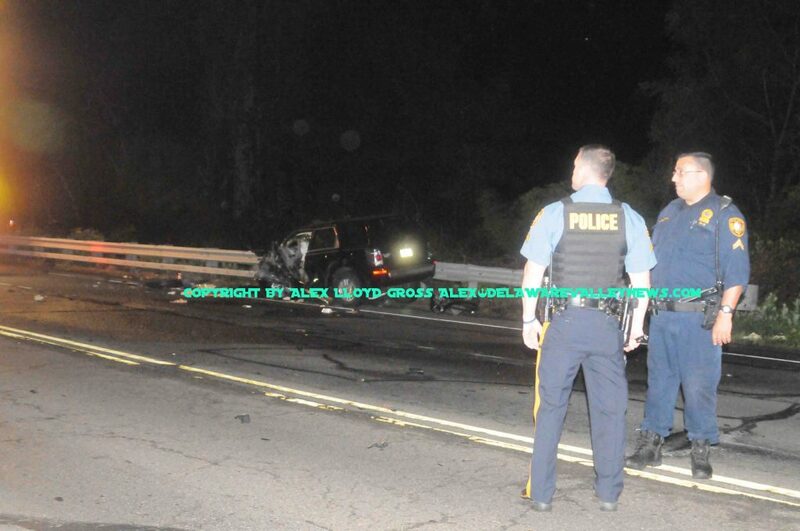 Alex Lloyd Gross photo- Police investigate the crash scene on W. Lincoln Highway. Falls Township Police are treating an accident like a fatal with critical injuries on the 200 block of West Lincoln Highway June 2 2018 . Details are sketchy but we do know that one SUV was traveling south when the driver crossed the line and slammed into a northbound vehicle. This was a high speed crash and injuries to at least one driver are said to be critical. A third vehicle was involved and police think the damage was just from debris. That driver was not injured. Falls police are going to be doing a toxicology test on the southbound driver to determine if he was under the influence of something. His vehicle went into some woods after the initial impact, before coming to rest in a patch of Poison Ivy. Fire police were special called to divert traffic and keep it from the scene. It is unknown if either of the vehicles had passengers in them. The area is expected to remain closed for several hours.